Turkey platters are big. There's no getting around that fact. I'd like to land the bird plate on something pretty. But I don't have anything big enough for the job or pretty enough for the feast table. This darling trivet is extra large and just the right amount of pretty. AND... It's reversible, so it will blend with your Fall decor all the Autumn season. Nope. Not hard at all. There is a technique to them, so they take a little courage and a little practice. But after making one or two you'll be a pro! If you didn't read (and sew along) last week's Dresden skill builder post, go do that before you go any further here. And while you are there, make the second plate too. Make them Sunflower colors. If you DID read and sew along, you are already a pro! You'll still need that second plate though, so if you didn't make it already, do that now. I'll meet you here when you have those two plates made. If you sewed along last week but not with sunflower colors, not to worry! Hold onto the Dresden you made. It will come in handy soon... ok I don't know when, but we'll use it. 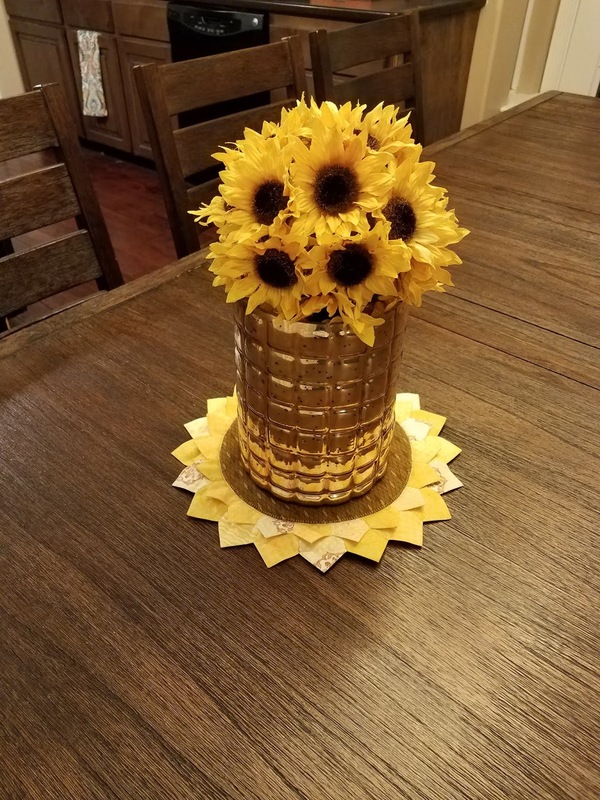 Meantime, go make the two sunflower color Dresden Plates. I'll wait. This is where I share the bad news: While transferring digital photos of this project, something hiccuped and all the photos were deleted from both devices. I suppose they are living in the cloud somewhere. Good news is, it's not a difficult project. The Dresdens are a challenge, but those pics are intact in last weeks post. Email me if you have questions regarding the pattern. I'll usually answer within a day. 2 Dresden plate rings in Yellow or Gold. One 12 1/2” diameter (5” wedges), one 10 3/4” diameter (4 1/2” wedges). Here's the link to last week's tutorial. Since you are starting with the rings already made, this project goes pretty quickly. We'll start with the bottom layer and make our way to the top. From the insul-bright, cut a 10 ¼” circle. 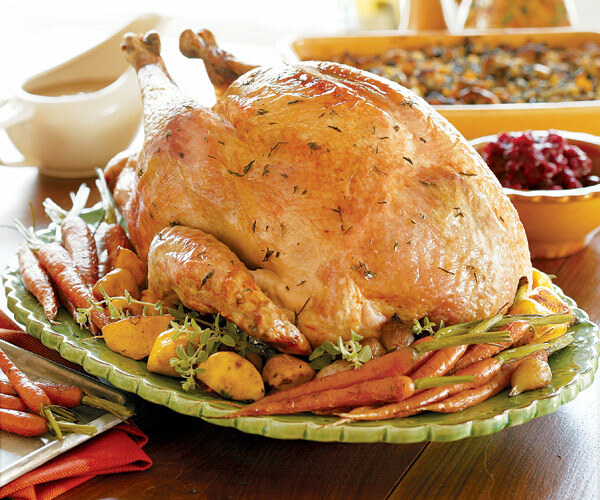 Fold the turkey fabric right sides together. 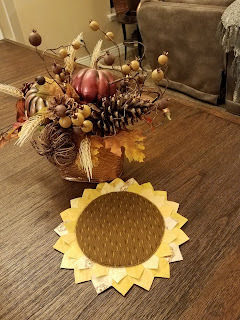 Using the template, draw a 10 1/4” circle on the back of the turkey fabric. Leave about an inch margin of fabric all around. Rough cut both layers of the turkey fabric about 1” outside the drawn circle. With right sides together, sew around the circle 1/4” outside the drawn line. Using pinking shears (if you have them) trim the seam allowance to a scant 1/4". Pinch each layer of fabric in the center of the circle and pull them apart. When you are sure you only have one layer of fabric between your fingers, snip a hole into the middle of the fabric on the side that will not be visible. Turn the circles right side out through the hole. Run your fingers (or a blunt object like a chopstick) gently around the inside of the seam to push all the seams out evenly. Be gentle so you don't poke through the seam. The circle should lay flat and measure about 10 1/2” in diameter. Now stuff the Insul-bright circle into the hole. Fiddle with it until it lays flat and even inside. Press. You don't need to close the cut, just make it lay flat. Lay the large Dresden ring face down. Center the insul-bright layer, cut side toward the Dresden. Pin the Insul-bright layer to the Dresden at EVERY shoulder. You need to cover all the raw edges of the wedges without the bottom fabric showing from the top. It may skew the wedges some, but it will all work out. Using a guide foot, sew the circle onto the Dresden ring just a few threads inside the circle. Remove pins as you come to them. Turn the project over, Turkey fabric down, and encourage all the wedges to lay as flat as they can. Press if you like. Aren't you glad you make those Dresdens ahead of time? 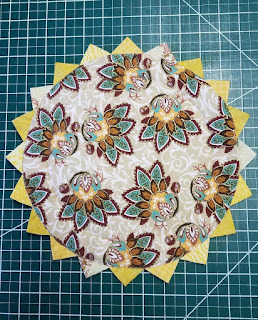 Cut one 8 1/2” circle from the Sunflower center fabric. Lay the circle right side down on the batting square. 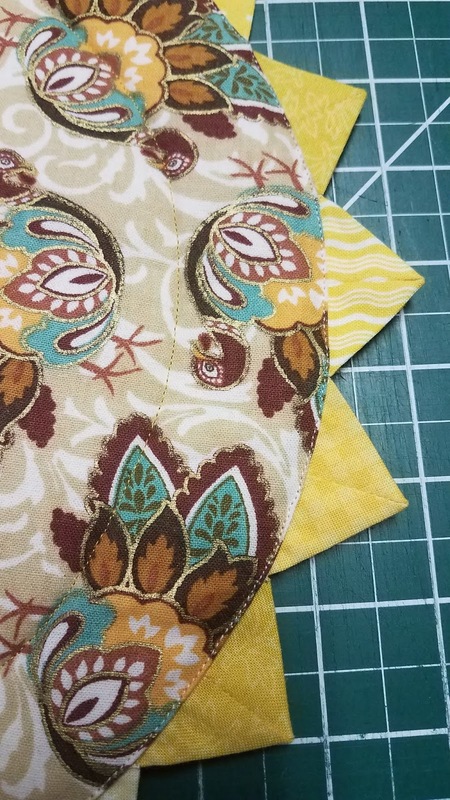 Sew around the circle with a 1/4” seam allowance. Clip the batting 1/8" from the stitching. Pinch each layer (one fabric, one batting) in the middle of the circle and pull them apart. When you are sure you only have batting between your fingers, make a cut in the middle of the batting. Turn the circles right side out through the hole. Run your finger (or a blunt object of some kind) around the inside of the seam to push all the seams out evenly. Manipulate the edges until they are smooth and none of the batting shows from the top. The circle should lay flat and measure about 8” in diameter. The cut in the batting should lay together nicely. Press from the top. Lay the small Dresden ring face up. Arrange the prepared center in the middle. Pin generously. 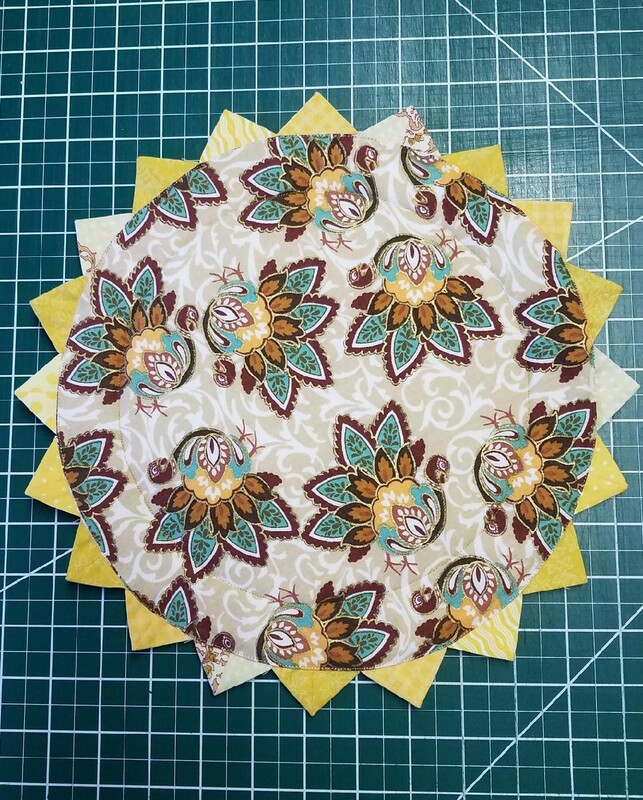 Sew the Sunflower Center onto the Dresden. Use a guide foot for a straight stitch, or use a decorative stitch. I used a button hole stitch just for fun. Arrange the small Dresden plate onto the large Dresden plate, Sunflower face up, turkey fabric face down. Pin generously. Using a guide foot, straight stitch around the Sunflower center very close to the circle. I had planned, at this point, to use the guide foot and sew all the points of the small Dresden wedges flat against the large Dresden. But I really liked the 3D look of the points. So I just hand stitched a tacking stitch on each shoulder of the wedges, (see photo above) traveling the needle through the layer of Insul-bright. That took care of the raw edges and gave me the loose petals that I love. 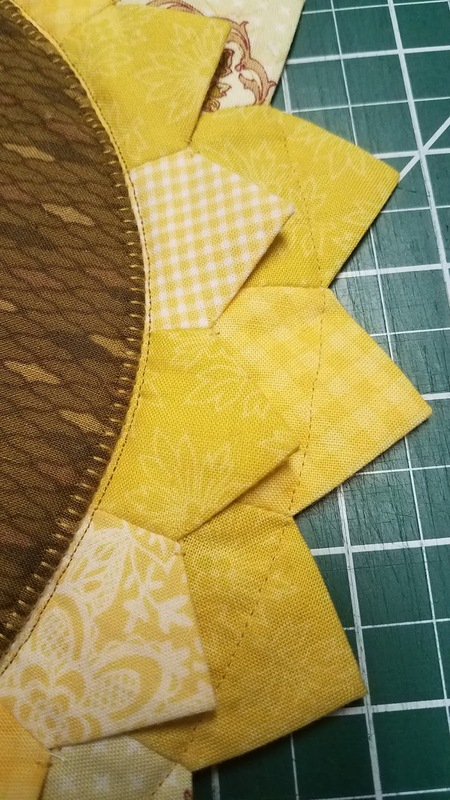 If you feel like your center batting needs more quilting, you can crosshatch the center after sewing it to the small Dresden, or, to quilt the insul-bright layer as well, crosshatch when everything is assembled. Enjoy your new XL trivet. Share pictures on the Seamless Piecing Facebook page. Stop by next week. The Universe has arranged a special treat that will be revealed here on Halloween! Love your 3-D Sunflower Trivet. Thanks Cat Lady. I'm glad you like it. It was all made with scraps on hand so it has the added benefit of not needing a budget. Perfect for this time of year.